There were no fatal casualties among Ukrainian troops in the last 24 hours, and seven soldiers sustained wounds and injuries, said the spokesman of the Ministry of Defense of Ukraine on ATO related issues Colonel Andriy Lysenko at a press briefing at Ukraine Crisis Media Center. The number of shooting attacks remains the highest in the Mariupol sector, reaching 57 incidents of ceasefire violation. Russia-backed militants are using cannons, tanks and mortar launchers. Eastern approaches of Mariupol became the epicenter of combat. Insurgents launched over 70 artillery projectiles and 160 mortar shells at Ukrainian positions along Hnutove – Talakivka – Vodiane – Shyrokyne frontline area. “The armistice was violated three times in the Mariinka district. ATO troops registered two brief mortar attacks. Occupant troops launched 10 artillery shells in Taramchuk and instigated a number of armed provocations in Troitske,” said the spokesman. In Luhansk sector the combat was the most active in Novyi Aidar district, where militants launched 25 artillery projectiles and over 50 mortar shells near Krymske. Russia-backed groups widely deployed grenade launchers and delivered massive mortar attacks, launching 50 mortar shells at ATO troops’ positions. According to Col. Lysenko, Ukrainian troops registered one brief mortar attack near Novooleksandrivka, and the other five incidents of ceasefire violation involved use of small arms and grenade launchers. In Stanytsia, Luhanska district, militants shelled Ukrainian positions in Malynove from mortars, and opened fire from sniping weapons in Stanytsia Luhanska. In Luhansk sector 16 militants’ attacks took place, and half of them involved use of heavy armor. In Donetsk sector the intensity of militants’ attacks decreased in Avdiivka and the outskirts. Insurgents are using heavy weapons more rarely. Repair crews renewed power supply of residential quarters and coke plant. Water supply in Avdiivka takes place on a scheduled basis from the town reservoirs. Main repairmen’s efforts today will be directed on renewing power supply at Donetsk filtering station. 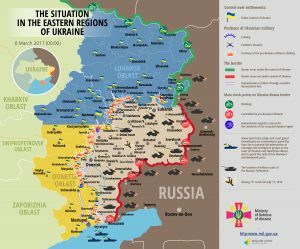 “Law intensity combat continues at the Svitlodarsk bulge, Horlivka perimeter and near Donetsk airport. Heavy armor, namely mortar launchers, is used from time to time. Militants conducted 35 shooting attacks at ATO troops’ positions in Donetsk sector yesterday, and 18 of them involved use of heavy armor,” said the spokesman. Report on the military developments as of March 7 is available here. Interactive data on the shelling: chronology shelling chart and the interactive map.